In the first half of the Eredivisie-season sixteen arbitration errors made after interference from the VAR, who last summer made its appearance. The number of errors is due to the videoscheidsrechter or 70 per cent. Of the sixteen errors were seven times undeserved, whether or not a penalty is awarded, eight times was incorrectly or not red is drawn, and the one time it was wrongly a goal is approved, according to Thursday figures from the KNVB. The goal concerns the 1-3 of Ajax midfielder Frenkie de Jong, in the away game on 23 december against FC Utrecht. Referee Dennis Higler ruled it wrongly that Ajax attacker Kasper Dolberg not visibly offside. One of the wrong decisions in a supposed red card in the match VVV-Venlo against FC Groningen (0-0) on 9 december. Referee Serdar Gözübüyük pulled in Venlo red for VVV-defender Jerold Promes after a hard violation on Ritsu Doan, but put that card – wrongly, as doth the KNVB to be in yellow after he on the advice of the VAR, the images had seen. Also Ajax captain Matthijs de ligt had a weekend red need to get. He took in the 1-4 win away game against PEC Zwolle, broke through Kingsley Ehizibue down, but it remained at yellow of an arbitrator Jochem Kamphuis. 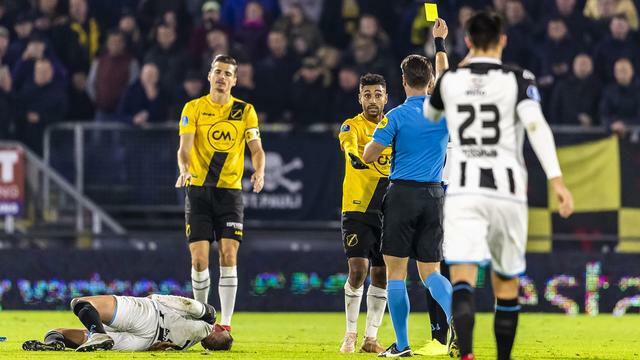 The hard violation of NAC midfielder Anaour Kali on november 3 against Heracles Almelo – yellow to a result – is one of those decisions. Also within the KNVB led to the absence of red to discussion. “Because of the hard earnings of Kali, we have a preference for a red card,” says Van Egmond. Van Egmond also emphasised that the VAR of the discussion about arbitration decisions are never completely will take away, but he looks pretty happy back on the first months of the VAR in the Premier league. The expectation of Van Egmond is that the number of errors in the Premier league to be even smaller, though he thinks it is a bit early to be on the basis of a half-Eredivisie-season expectations.